An incredible tour that takes you to the Moremi Game Reserve, Chobe National Park and the Victoria Falls. 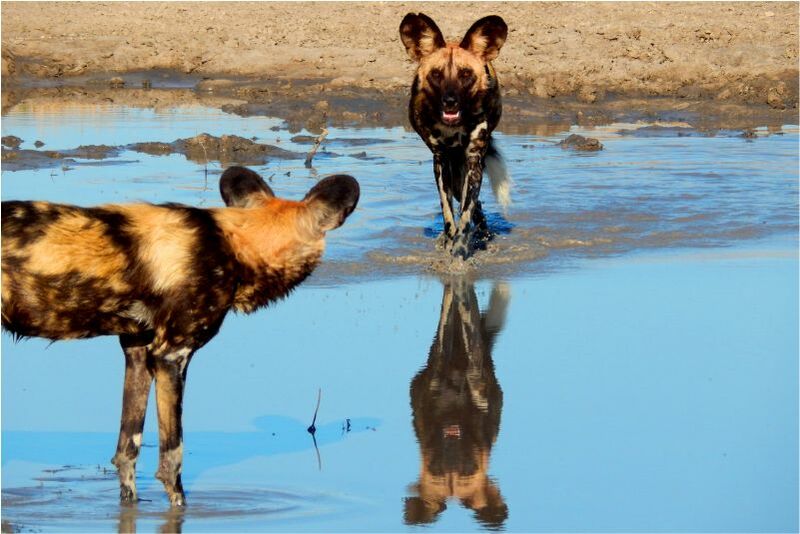 The tour starts in Maun from where you will make your way to Khwai in the Moremi Game Reserve. 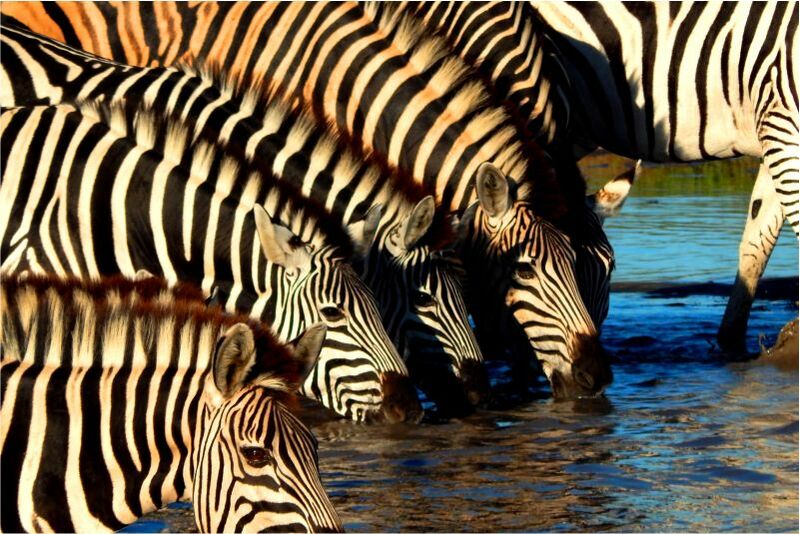 Moremi is one of the world’s top wildlife destinations and covers one third of the famous Okavango Delta. You will stay here for two days. On day three you will head to Savute in Chobe National Park. In Savute you will see some amazing game, giant heards of Buffalo, Elephants and Antelope are common residents. On day five you will travel further north to the Chobe River, the soul of all of life found in this Northern end of Botswana. You will experience some amazing game drives and river cruises here. Day seven will bring you to the mighty Victoria Falls, where you will have enough time to explore the Falls and do some activities. What more could you ask for? 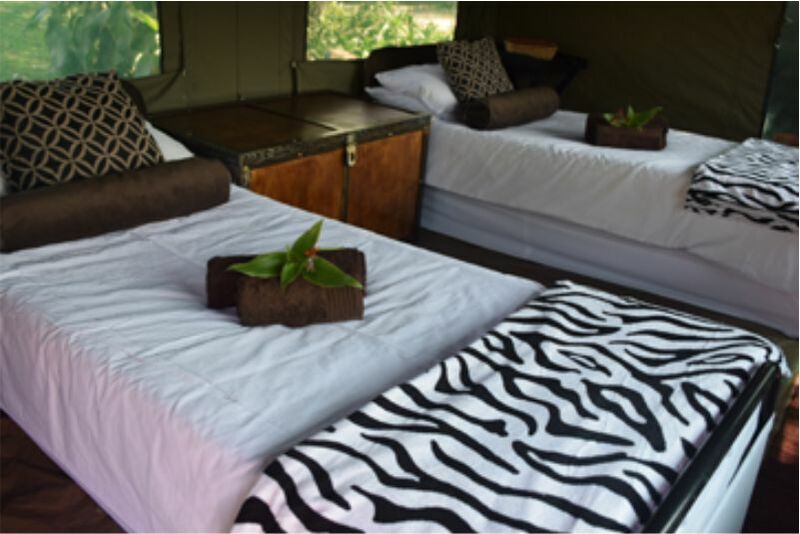 Royale Wilderness mobile tented camping, Private and Exclusive camp grounds, Khwai Concession area near Moremi Game Reserve, Chobe National Park, Savute, Chobe National Park, Ihaha/Serondela area, Chobe River Cruise, Amadeus Garden or Similar (Victoria Falls), Victoria Falls. You meet your Guide upon your arrival in Maun, usually around middle of the day. After a short introduction, and a possible stop for last minute shopping for small items, you head out by road to Khwai. 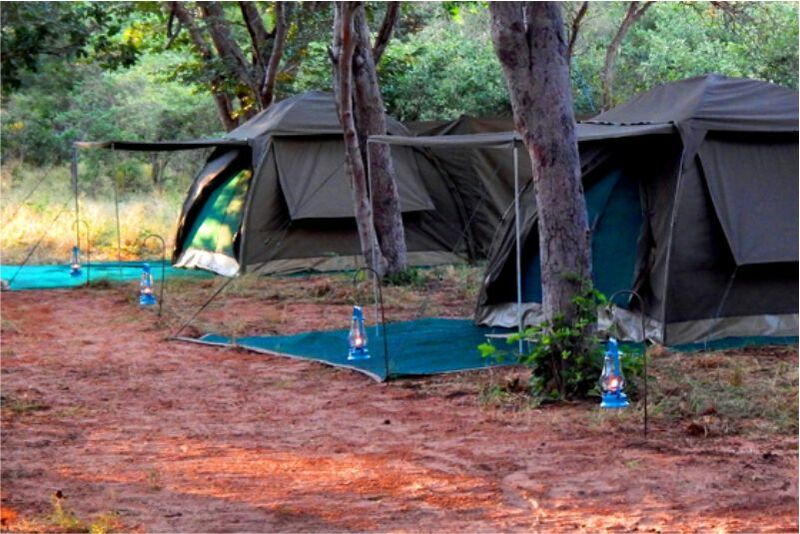 Approximately 4 hours later, with the last hour being game viewing along the Khwai River, you will arrive to find you camp already set, by our Crew. Your expected time of arrival in Khwai is around 1700hrs. 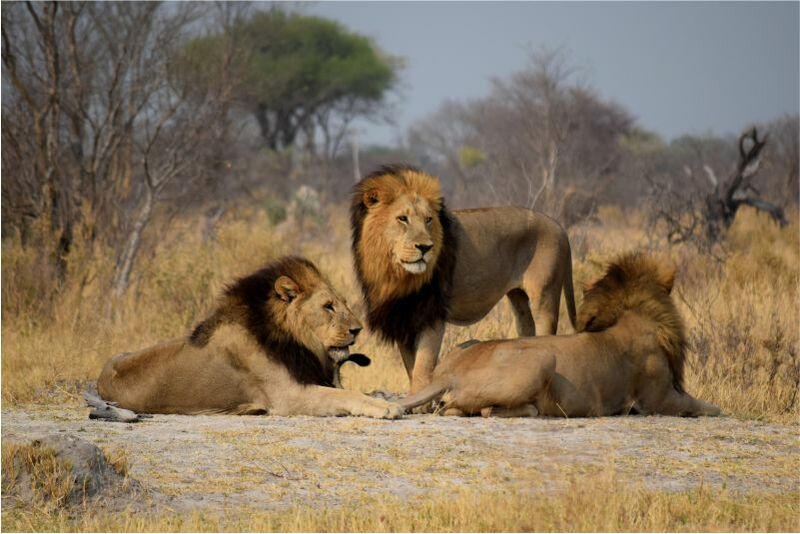 Covering one third of the Okavango Delta, Moremi Game Reserve is undoubtedly one of the top wildlife destinations in the world. It is set within wildlife management areas, allowing free movement of wildlife across its borders. The Khwai floodplains, contrast beautifully with the lush island vegetation of the Xakanaxa area. Head upon head of animals come down to drink from the Khwai river, drawing along predators from the woods. The bird life is exquisite. You are woken up early in the morning on day 3. After breakfast, we head out for game viewing along the Khwai River. We later leisurely head to Savute, with a picnic lunch along the way. Time allowing we may do another introductory game viewing in and around the Savute Marsh before we get into camp. This day is long, with the expected time of arrival at our camp in Savute around 1700hrs. Savute is a small channel of water that breaks out of the northern water system called Linyanti that itself divides Botswana from Namibia (Caprivi). 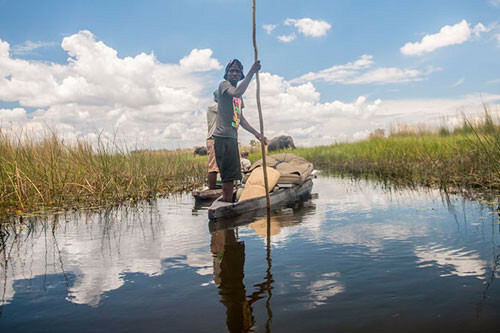 The channel flows almost due east and then cuts through the dunes or sand ridge that once marked the edge of a gigantic lake that linked the Okavango and the Makgadikgadi pan complex. The Savute Marsh has been fed erratically over the past 100 years, without any pattern in time, but obviously in response to floods and dry seasons, from different sources. When the channel flows, Savute is paradise in itself. Giant heads of Elephants, Buffalo and Antelope are common residents. It is perhaps when the river Stops or suddenly starts flowing after many years of absence that Savute is most dramatic. You will stay 2 nights in the Savute area. In this time, you will travel back many years to understand the dynamics of the Savute channel, the Marsh and its dependent wildlife. 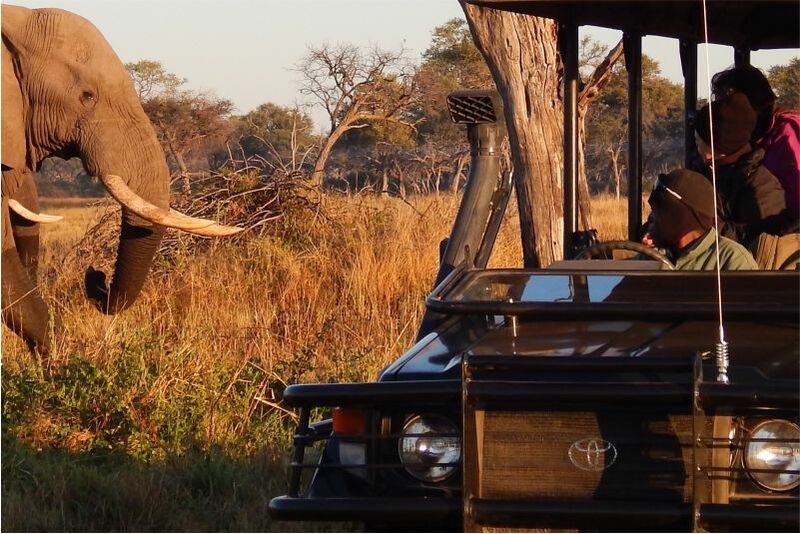 Activities: Morning Game drives, Afternoon Game drives (all activities are in open safari land cruisers only). You are woken up early in the morning, day 5. After breakfast, we head out for Game viewing in the Savute area. A little later in the morning, we leisurely head out towards the Chobe River front area, with a picnic stop along along the way. With time allowing, we will do an introductory game viewing along the Chobe River. This day is long, with the expected time of arrival in camp around 1700hrs. The Chobe River essentially, is the soul of all of the life found in this northern end of Botswana. In the dry season, there is not another place on earth that has better concentrations of Elephants, Buffalo, Sable, Hippopotamus and many more in one small area. It is truly a world wonder. It is then fitting to finish one’s safari here. The predator life is equally drawn to the river front as it follows the prey species to the water side. Both Lion and Leopard are frequently seen here. You will stay here for 2 nights, allowing you time for a river Cruise on the Chobe. 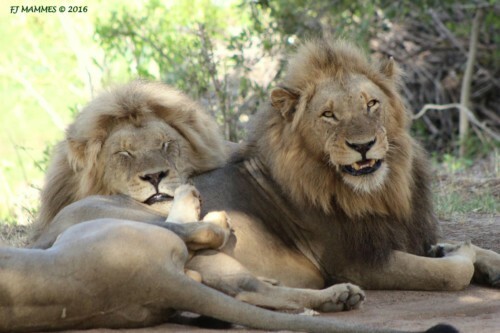 Activities: Morning Game drives, Boat Cruise, Afternoon Game drives. You are woken up early in the morning on day 7, after breakfast, we leisurely head to the Kazungula Border. Your Botswana Guide will hand you over to Your Zimbabwe Guide who will take you to your hotel in Victoria Falls. From the Border, your journey to Vic Falls is only 1 hour. When Dr David Livingstone first set his eyes upon the falls, he penned down in his diary “Scenes so beautiful they must have been gazed upon by angels in their flight”, this was in 1851. To this day Victoria Falls, as he called them, are world renowned. There is all manner of activities one can do in Victoria Falls: White Water rafting, Bungee Jumping, Flying over the falls, Vic Falls Tour on Foot, Elephant back riding, Lion walking, Gorge Swinging. One should not miss the African entertainment at the Boma, Victoria Falls Safari Lodge, over dinner comprising of many traditional cuisines. 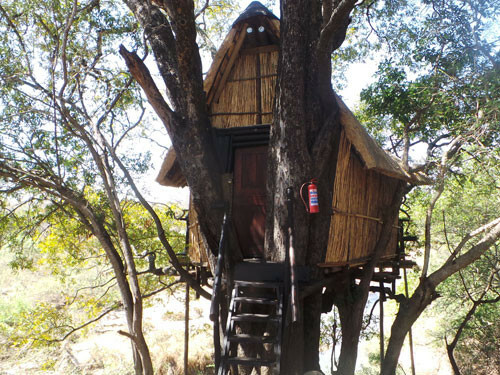 You will stay here 2 nights, giving you ample time to manage all the activities available in Vic Falls. Optional Activity: White Water rafting, Bungee Jumping, Flying over the falls, Vic Falls Tour on Foot, Elephant back riding, Lion walking, Gorge Swinging. Transfer to Victoria Falls Airport for onward Connections. End of the tour. 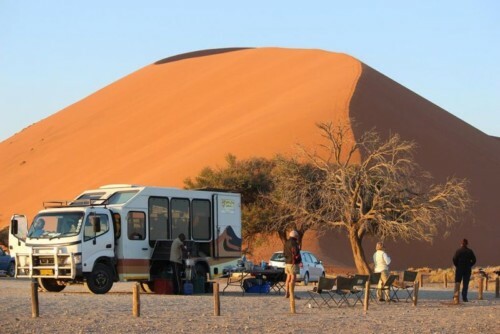 Tours are offered with two exciting camping set ups. The traditional large Dome Tent and the Mini Meru tent style. Both are comfortable, with steel beds fully furnished with a complete bedroll and towels. Both are ensuite, with a private shower and toilet area. Our dome tents are large 3m x 6m, with a sleeping area of 3m x 3m, and a similar back extension area that accommodates a private shower and toilet. The toilet is the traditional short drop, while the shower is a canvas bucket shower filled with warm water by our dedicated crew before shower time. The shower and toilet area is open top, allowing a romantic under the stars shower experience in the evenings. Illumination at night time is battery charged lamps for the individual beds, while the large windows provide ample light and ventilation during the day. Tents are furnished with complete bedrolls, with cotton linen, duvets and a blanket or two depending on the season. Guests are provided with 2 towels and a facecloth, as well a bar of soap for the shower area. Our dedicated crew is in charge of the camp lay out and setting up of the tents before the Guests arrive. 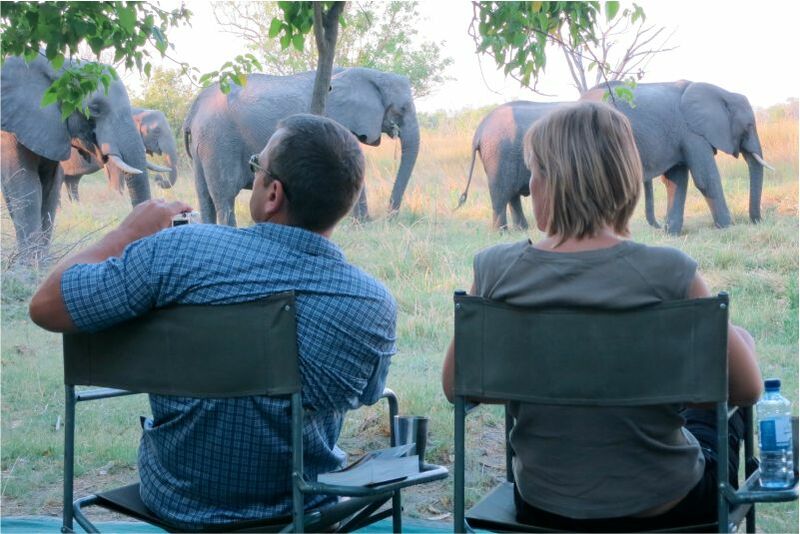 Our guests spend their time with the wildlife, without worrying about the tediousness of camp duties. 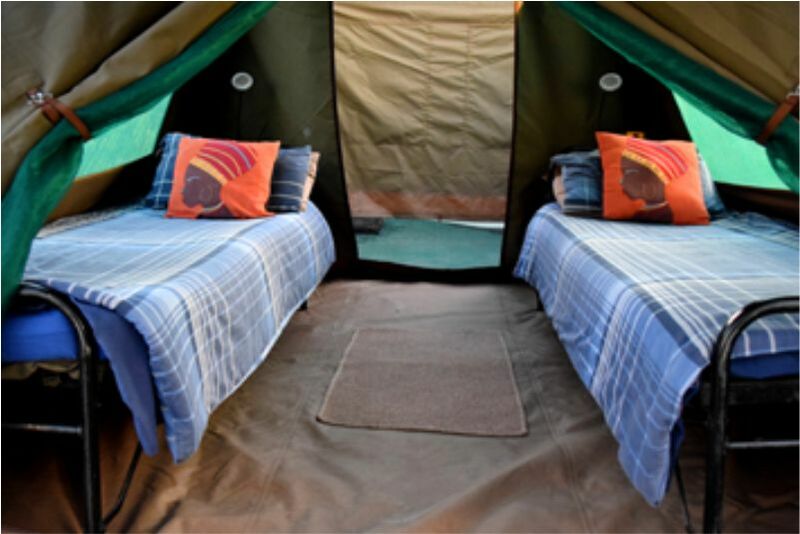 The Mini Meru tents are 7m x 3m, with a sleeping area of 4m x 3m, and a shower and Toilet extension of 3m x 2m. The toilet is a traditional short drop and a canvas bucket shower that hangs from a steel pole, filled by our dedicated crew before shower time. With the larger space in the tents, we can set up our beds to accommodate double sleeping arrangements and twin arrangements. Each bedside has a battery powered lamp, and a small table. Bedrolls are complete with white cotton linen, duvets and a blanket/s depending on the time of the season, 2 towels and a facecloth. A bar of soap is provided in the shower area. Our dedicated crew is in charge of laying out this exquisite camp, and setting. All transfers by road from Maun to Camps and between Camps, All Game viewing activities as per itinerary, All accommodations in twin bedded tents with private shower and toilet area, All meals, All drinks (South African Wines and a selection of Spirits), 3 hour boat cruise in Chobe, Park entrance, Camping fees and VAT (Where applicable), Emergency evacuation to the nearest hospital, Road transfer from Kasane to Vic Falls, Accommodations in Vic Falls on a Bed and Breakfast only, Laundry Service (when camping). Travel insurance, International Flights and Visas, Airport Taxes, Tips and gratuities, All drinks at Hotels, All activities in Vic Falls, All Lunches and Dinners in Vic Falls, All items of personal nature. The tour starts in Maun from where you will make your way to Khwai in the Moremi Game Reserve. 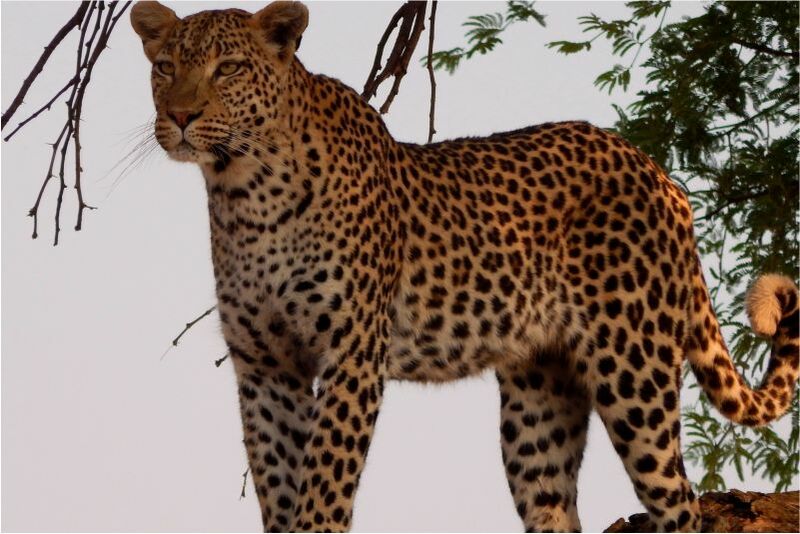 Moremi is one of the world’s top wildlife destinations and covers one third of the famous Okavango Delta. You will stay here for two days. On day three you will head to Savute in Chobe National Park. In Savute you will see some amazing game, giant heards of Buffalo, Elephants and Antelope are common residents. On day five you will travel further north to the Chobe River, the soul of all of life found in this Northern end of Botswana. You will experience some amazing game drives and river cruises here. Day seven will bring you to the mighty Victoria Falls, where you will have enough time to explore the Falls and do some activities. What more could you ask for?